Spring in Charleston… There is nothing more spectacular. Quickly scroll through Instagram, and you are immediately captivated by the beauty of this season in the South. It was a tough choice, but we hand-picked our top five April photos to share with you. Makes you immediately want to plan that trip to the Lowcountry, doesn’t it? 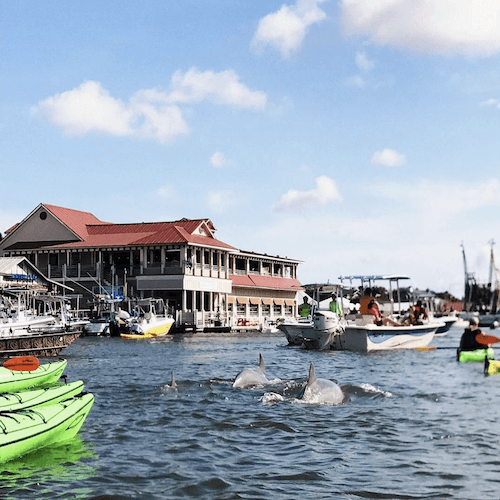 With walls of flowers, secret gardens, dolphins jumping, and the freshest seafood you can find, there is something for everyone in Charleston, and our goal is to provide the best location and accommodations for you to experience it all. Yet again, Charleston has been named “South’s Best City” and “South’s Friendliest City” Southern Living Magazine. The Pineapple Fountain at Waterfront Park (just a couple blocks from The Charleston Chestnut Mansion) is a true symbol of our Southern hospitality and has been beautifully captured in this photo by The Charleston Convention and Visitors’ Bureau. 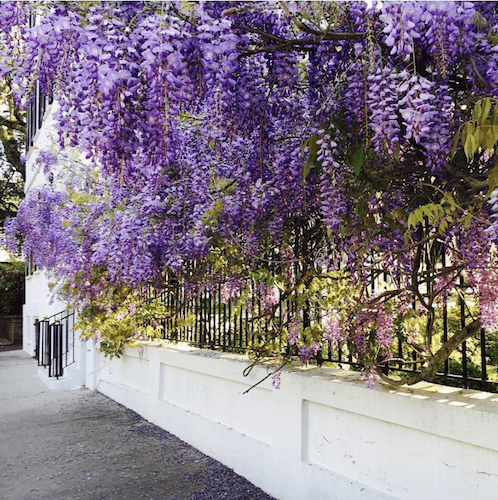 Head a few blocks west to Meeting Street where Charleston Magazine’s Art Director Melinda Smith-Monk captured this wall of wisteria. This location has quickly become one of the most popular photo-op locations in the city and is, rightfully so, the magazine’s April cover. 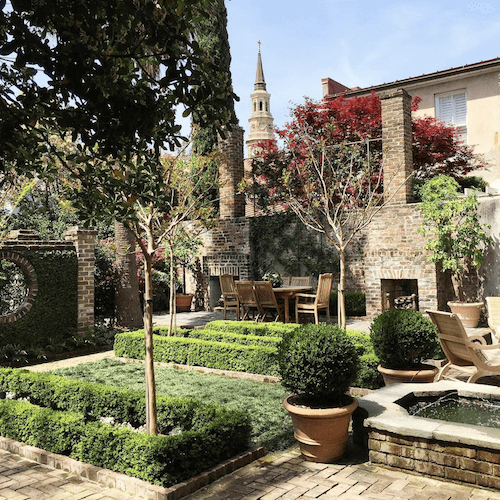 At the end of Meeting Street, on State Street, Charleston Magazine also shot this walled garden designed by Sheila Wertimer. The garden is anchored by four young Crepe Myrtles, whose blossoms will bring a pop of color come summer. Andre Michaux, famed plant explorer and royal botanist, introduced the tree to Charleston in 1786. Dispatched to America by Louis XVI and Marie Antoinette to gather plants of the New World for the King’s garden at Versailles, Michaux established and maintained from 1787-97 a 120-acre botanical garden in North Charleston on the site where the airport now stands. Michaux is responsible for bringing many exotic plants here, including our first camellias, which he presented to his friend, Henry Middleton of Middleton Place. After all this site seeing, you’ll surely be hungry, and just two blocks from The Charleston Chestnut Mansion is the esteemed High Cotton Restaurant. 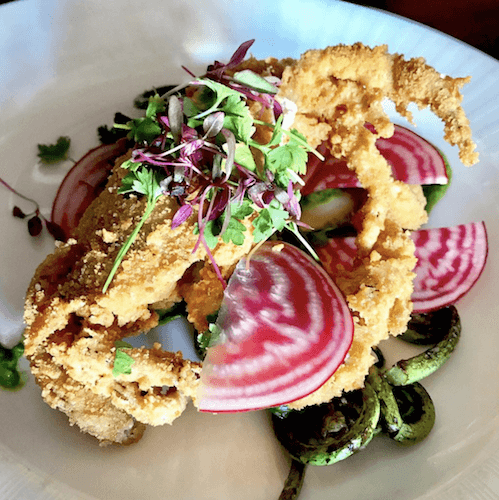 Soft shell crab is in season and ready to be served! High Cotton is one of our favorite dining spots, and we can tell you this dish will not disappoint. If dining al fresco is what you’re craving, take the short drive to Mount Pleasant to Tavern and Table on Shem Creek. Sitting outside you can see the shrimp boats coming in and even catch a glimpse of dolphins playing, as Charleston photographer Kim Graham did here. This is also a great place to rent kayaks and stand up paddleboards to spend the afternoon on the water. With so much to see and do, we hope you, too, will enjoy a Spring in Charleston. Be sure to capture the special moments of your trip and share those enviable photos with your friends, family, and us.